Visitation Tuesday 4-7 P.M Rosary Service 7 P.M.
Helen was born December 27, 1929, on the family farm south of Clarkson, to Louis and Rose(Dibelka) Vondra. She attended school at District #21 and graduated from Schuyler High School in 1948. On August 10, 1948, she married Walter G. Blum at St. Xavier Catholic Church in Council Bluffs, Iowa. They lived and farmed northwest of Schuyler until moving into town in 1993. Helen was a farmwife, played the drums for the Walter Blum trio, enjoyed gardening, dancing, crafts, quilting and playing cards. 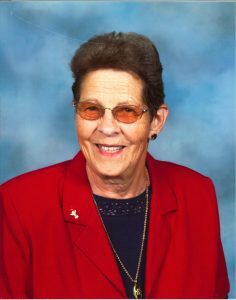 She was a member of St. Mary’s Catholic Church in Schuyler. Helen is survived by two daughters;Kathy(Garry) Willnerd of Hooper and Deb(Mike) Muhle of Schuyler, two sons;Ken(Barb) Blum and Doug(Renee) Blum, all of Schuyler, a sister-in-law Dorothy Vondra of Schuyler, 10 grandchildren, 13 great-grandchildren and one great-great-grandchild. She was preceded in death by her parents, husband, grandson, Andy Muhle and two brothers ;Ladislav and Lumir Vondra.